U18; Brilliant Result in Ballygarvan. Our first round of the Minor A League was held on Sunday last against Ballygarvan away. On a weekend, where the majority of matches across the county were cancelled/postponed, we headed off to Ballygarvan, to get our first match over with. The rain held off for most of the match but the conditions underfoot were very soft. We lined out with only 14 starters, due a number of injuries but the attitude of the players was fantastic, knowing that we had an uphill battle even before the game began. We started the game well but with a man down, we had to soak up big pressure but the five forwards worked extremely well when attacking and especially hooking and blocking without possession. During the first half, we found ourselves 10 points down but the team rallied again to come in at half time, down by 5 points, the score line 3-07 to 2.05. At half time, we made a few positional changes and with James Kearney and Pearse Varner working extremely well in midfield, we closed the gap and found ourselves leading by 1 point with 15 minutes remaining. Two minutes later, we were reduced to 13 men for 2 yellow cards, which in a way, made this victory more satisfying. Keeping our shape from the first whistle, was essential if we were to get anything from this game and huge praise must go to the team for playing so effectively. Jamie O Leary deserves a mention, playing the centre back position, he martialled the defence from start to finish. With time up, we were leading by 2 points when Ballygarvan scored a goal to lead by a point and the seemingly win the game. Our âNever Give Upâ attitude, rallied the team and with the first puck out in extra time, Alex Henley pulled to score the winning goal. Barry Murphy added a further point from a superb puck out and with that the whistle blew. We ran out winners by three points on what was an excellent team performance from numbers 1 to 14. With such an excellent team performances, it is hard to pick out any particular individuals, but a special mention must go to Keith O Leary and Jamie O Leary, who after suffering disappointment with not making the Cork 24 man squad for the First Round against Waterford, both put in man of the match displays. Our next match is on Saturday April 9th at home against Valley Rovers. Throw in is at 6.30 so hopefully we will drive on from last weekâs great display. We had good support last Sunday in Ballygarvan so weâre are looking forward to great home support this weekend. We would like to congratulate Shane Hogan from the Abbey Tavern, who recently won First Prize in our Easter Raffle. Scott O Brien sold the winning ticket and won a â¬40 Cummins Sports Voucher. Well done Shane, Scott and everyone who sold tickets for the raffle. The Castlelyons Juvenile GAA Club would like to congratulate Niall O Leary as he captained the Cork Minor team to their first win of the season against Waterford. Niall has been truly dedicated and committed over the past twelve months and all his hard work has now paid off. He did his club and parish very proud. Last week, we mentioned that Barry Murphy had made the Cork 2016 Hurling and Football U17 panel. We were a bit quick off the mark, as the panel has not yet been fully completed. We wish Barry and all the other players currently attending trials, the very best of luck and hope to have more news over the coming weeks. Last Wednesday, we welcomed Kinsale for the first round of our U12 Football league. We only had 11 players available to us on the night but the lads put in a great effort, especially in the second half to sneak a win in the end. Our team on the night was: Darren Counihan, Gearoid O Sullivan, Brian Spillane, Mark Cullinane, Leon Shanahan, William Verling, Marc Callanan, Oisin Morrisson, Aaron Fenton, Cees Kwoenberg, Will Buttimer and our sub Olan Lenehan. Next up in our Football is a meeting with Lee Gaels, away next Friday 8th. Training will continue twice weekly, dates may change due to matches and pitch availability, so keep an eye on texts. U14 hurling challenge vs Ballygiblin 31/03/16. This was our first game of the year and turned out to be a highly competitive game with both teams giving it all in a very even first half. Ballygiblin came out stronger in the second half and went on to win this match on a scoreline 2-11 to 1-04. Team Gavin O Neill (captain), Michael O Sullivan, James Cullinane, William Moran, Dara Spillane, Leon Doocey, Oscar Hallihan, Stephen Casey, Declan Morrison, Eoghan Dolan, Evan Lenehan (0-1), Colm McCarthy (0-3), Ian O Sullivan (1-0), Scott O Brien, Michael Griffin. Subs Ian Ryan Alex Murphy Peter Greaney. U13 football league vs St. Colmans 4/4/16. We played our first u13 league match in Castlelyons, playing some very good attractive football only to find ourselves three points down at half time but as we know with this bunch of young lads who have great spirit and determination they came out strong in the second half and easily out- scored our opponents in that period. This was a high scoring game and great credit to all who scored. Final score Castlelyons 6-09 St.Colmans 5-02. Team Peter Greaney, Alex Murphy, James Cullinane Gearoid O Sullivan, Ian OSullivan, Dara Spillane (captain), Michael O Sullivan, Evan Lenehan, Colm McCarthy, Oscar Hallihan, Cees Kowenberg, Aaron Fenton, Jody Whelan, Ian Ryan, Michael Griffin. Upcoming fixture can be viewed on the Rebel Og website. Our U16 team took on Brian Dillons in the Rebel Og East Fe 16 C Hurling League 1. We played very well and the weeks of training have been of great benefit. The lads put in a great team effort and the final score reflected just that, finishing Brian Dillons 0-03 Castlelyons 5-18. We are back training later in the week, with times and venues being confirmed by text. Our next Lotto Draw will take place on Monday 11th April in the Abbey Bar. The jackpot is now a massive â¬8000. You can purchase your ticket at any of the training sessions over the coming week or from the many local businesses and promoters, Fitzgerald Butchers Fermoy, The Abbey Bar Castlelyons, Glanbia & Centra Castlelyons and Murphyâs Vehicle Repairs to name a few. There are 8no lucky dips of â¬20 drawn for every week the lotto jackpot isnât won, so for â¬2, the return isnât too bad at all! Thank you to everyone who continually supports our Club Lotto. Please note that all matches are weather dependant and confirmation will sent by text prior to the match. 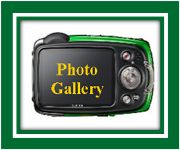 Updates will be on Twitter/Facebook. These dates and times are correct at time of going to press but may subsequently change. Saturday April 9th U18 Hurling V Valley Rovers in Castlelyons Throw in 6.30pm. 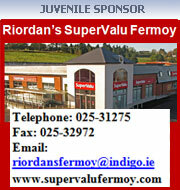 We would like to sincerely thank Riordanâs Supervalu for their ongoing sponsorship of the Juvenile Club. We would ask everyone, in turn, to support local and support Riordanâs Supervalu.